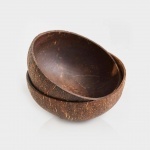 This is a raw natural coconut shell perfect for snacks, nibbles, stir frys, muesli and more. It’s also great as a table decoration. Due to the nature of coconuts, the dimensions given are an approximation as every coconut is unique, so there may be slight differences in size and shape. 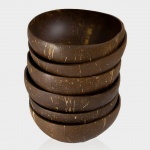 These bowls are made from discarded coconuts. They are cut, sanded, cleansed and left raw on the outside. Do not expose your bowl to extreme heat.